It’s great for us at Tribute Games to be back at the ol’ Playstation.Blog. Ah, has it been that long since our hotly commented post (16 scorching comments!) back in the summer of 2013? We’re simply thrilled to be part of Sony’s indie line-up for PS4. Having been a part of the E3 presentation is still a big deal to us. If you don’t know us at Tribute Games, we’re an indie developer way up in Montreal, Canada. We create classic-looking games with modern twists — in this case here, Mercenary Kings, which looks like a nice, old-fashioned, run-and-gun platformer from the bygone ’80s and ’90s… but it’s actually ENHANCED with a deep weapon and item crafting system! You can try to make your way and destroy C.L.A.W. (Cyber Loyalists Active Weapon) clan with your regular pistol, but as you progress through Mandragora Island and pick up materials, almost every character back at your HQ offers huge crafting possibilities. There are more than 300 gun parts to mix and match. You could enhance your weapon’s magazine capacity, or forge an elemental blade that can freeze your enemy. Make your mercenary invulnerable to the enemy’s toxic weapons, or use an ingredient you’ve found to boost your mission skills. It’s a pretty comprehensive customization system that should appeal to the RPG fan in you. Will you sacrifice accuracy for damage, or craft a smaller blade to be lighter on your feet? Or will you just build a weird, toilet-shaped rifle? (There’s also a cat-cannon and a fish-shaped knife!) A quick tap of R1 helps you reload faster than ever, while pressing L1 gives you access to Shock Bombs, Riot Shields, or deadly C4. 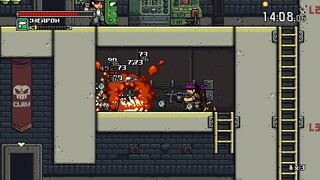 What we’re really excited about, though, is the co-op multiplayer in Mercenary Kings. Developing the game knowing it’s heading straight to a powerful, multiplayer platform like PS4 is, well — pretty amazing! Fueled by great memories of blasting down alien monsters with a friend in oldie classics, we want to recreate that type of fun on a modern console. Is there better friendship cement than blasting away giant Exo-suited soldiers or evil gods from other dimensions!? There could be, but we can’t think of any. And while it’s still early for us to talk about it, the connectivity possibilities between PS4 and Vita are quite exciting for further multiplayer mayhem. 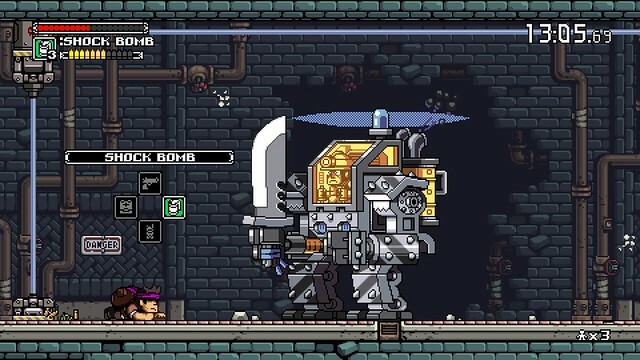 Mercenary Kings features more than 100 missions, with endless weapon-crafting possibilities. It looks familiar, but is quite innovative and will launch on PS4 this winter. And if that wasn’t enough, you can get a glimpse of the hostile hijinks of Mandragora Island in our exclusive biweekly comic on www.mercenarykings.com. The game is available on Steam Early Access already if you want to have a run at it earlier. 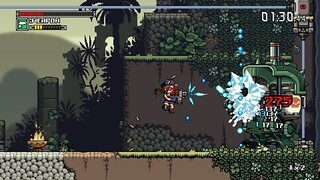 It’s pretty excellent though, a nice mix of Metal Slug and Monster Hunter. Looks awesome :D. I’m hoping for a Vita port down the road. Looks fantastic! I can’t wait, but I will! Huge fan of SPvsTW:TG. This looks like more great retro-awesomeness! Can’t wait for this and more from Tribute Games. Keep up the great work!!! Please after you’ve finished with PS4 version, make PS Vita version. The PC Beta was fantastic! I can’t remember…do I get a Vita or PS4 code for doing the Kickstarter or was it just PC? The game looks awesome! I’m sold. Looks great guys! I was interested in this game since you first launched the kickstarter, and am really glad to see it’s making its way to PS4! Not to mention this year! I’m sure that it’s probably too late at this point, but I have to say that this game would be perfect on Vita! While I’ll most likely get it for PS4, it just seems like a Vita version would be ideal as well. Totally on board with this. Pixels forever! Does the game have a platinum trophy???? Im not sure what to take from this. I will try it out , hope its a demo available. Please tell me you hear that noise! It is my Vita screaming for this game! Figure I’ll be the guy to push you over that scorching 16 comment threshold this time. Game looks great! love the graphics, gameplay looks fun, and co-op should be good w/ all the customization. would be sick on vita! 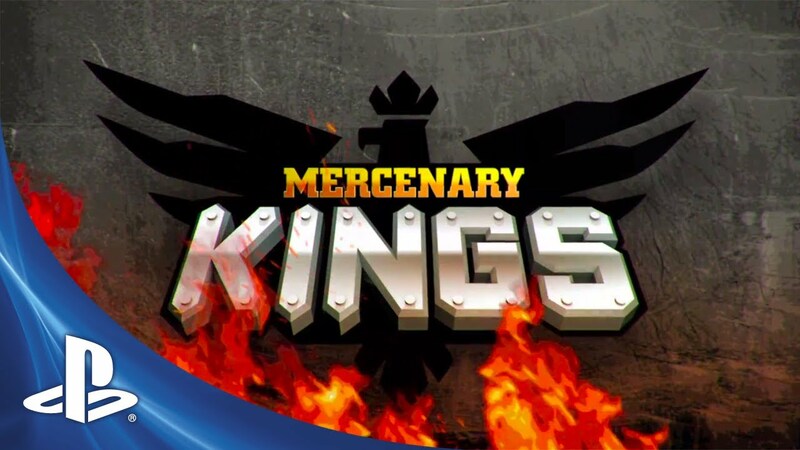 Will Mercenary Kings feature split-screen online/offline multiplayer? 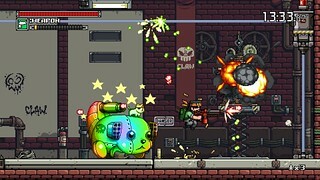 Looks like a great Metal-Slug-esque throwback, and a fine early indie. Dropping this Winter? I’ll probably have to pick it up with some extra Holiday cash, then! Why the people insist in making a game pixelated??? We have a full HD console, why the hell didn’t they make a game with a full HD awesome art, like Shank? Looks good, will check it out when it hits the store. You don’t have to buy it if you don’t like the art style. Some people can appreciate pixel art just as well as hand-drawn assets, just like some people enjoy Wind Waker-style graphics compared to Call of Duty. If the look of a game stops you from enjoying it, well… you should probably spend some more time on that middle school book report instead of leaving ignorant comments on the internet. 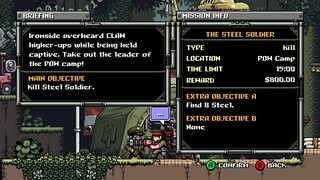 Please Bring this to the PSVITA its the successor to Metal Slug games that were on the PSP. I was lucky enough to play this game at E3 and loved it immediately. I was hoping that it was going to be released during the PS4 launch window and it looks like that is now true! Probably my most anticipated game at the moment! “the connectivity possibilities between PS4 and Vita are quite exciting for further multiplayer mayhem” – I’m taking that as a hint that a Vita version is coming. :) I certainly hope so! I love it!! This game is beautiful, I am going to buy it as soon as it comes out!!! …yeah it’s a good game. I played it ages ago on my friend’s Xbox 360. I already bought Mercenary Kings on the PC — I still need to get around playing it! I’m a fan of Metal Slug and Scott Pilgrim, so I can really dig something like this. Looks sweet! Love the Metal Slug vibe going on. This game reminds me a lot of MegaMan for some reason. Looks like it could be fun. Please bring it to VITA. Awesome. I can’t wait to play this. Too bad I didn’t preorder a PS4. I will be fighting the mad rush like a ravenous badger. This will be the first PS4 game I buy from PSN without a doubt. Looks awesome. You guys wouldn’t happen to be the creators of the Mercenary Madness game in PlayStation Home, would you? Watched the trailer, and the game looks fantastic. Very reminiscent of the old days. I look forward to getting this on PS4. Will be nice to play on the big screen, then when the kids gotta have the TV for Disney channel, I can pop over to the Vita with remote play and continue the missions all night long. Can’t wait to play, congrats on a beautiful looking game. You must be very proud of it. I’m really excited about this game. I resisted the urge to buy it on Steam so I could play it on my PS4. I just wish it was a launch game. who’s doing the music for this game? will the audio assets be 24-bit and/or lossless? will there be playable GLBT characters like in Scott Pilgrim? I agree with others, having a vita cross buy would be great since I won’t have a ps4 anytime soon. I saw both videos on your website. Was that….. a trumpet gun I saw there??? It looks like a lot of fun. I can’t wait to play it this winter. :) Greatness Awaits. this game is really cool it looks like metal slug. I love the way it looks and i can’t wait to get it by the way is it going to be online? I’m looking forward to this, Hotline Miami 2 and The Order early part of next year. It comes from the makers of Wizorb. Lots of RPG elements to it. I’m loving this game….Metal Slug style…damn Metal Slug was one of the games I most played on PS1 and I had so much fun with my cousins…..so this one would be an instant buy for me….but since you guys aren’t bringing for PS3 or Vita….I won’t buy.